This is the second Madhur Jaffrey cookbook in theMy Kitchen Table series. This new title will provide recipes for simple curries, perfect for cooking up quickly during the week. 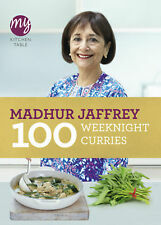 Author: Madhur Jaffrey. Madhur Jaffrey's Ultimate Curry Bible. Author:Jaffrey, Madhur. Book Binding:Hardback. Book Condition:VERYGOOD. Each month we recycle over 2.3 million books, saving over 12,500 tonnes of books a year from going straight into landfill sites. Madhur Jaffrey - Ultimate Curry Bible. 5 Cookery Books. Jamie Oliver - Jamie's Kitchen. John Burton Race - French Leave. Title: Madhur Jaffrey's Indian Cookery Item Condition: used item in a good condition. 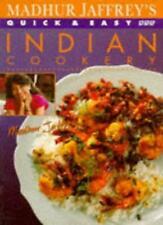 Author: Madhur Jaffrey ISBN 10: 0563164913. Authors : Jaffrey, Madhur. INDIAN SPICE KITCHEN 1995. Title : INDIAN SPICE KITCHEN 1995. Binding : Hardcover. Product Category : Books. Condition : Very Good. List Price (MSRP) : 9.99. Publication Date : 1995-02-23. Madhur Jaffrey's Spice Kitchen: Fifty Recipes Introducing Indian Spices and Aromatic Seeds. Author:Jaffrey, Madhur. Each month we recycle over 2.3 million books, saving over 12,500 tonnes of books a year from going straight into landfill sites. Author:Jaffrey, Madhur. Illustrated Indian Cookery Course. Book Binding:Hardback. Each month we recycle over 2.3 million books, saving over 12,500 tonnes of books a year from going straight into landfill sites. Author: Madhur Jaffrey ISBN 10: 056352183X. Title: Simple Indian Cookery Item Condition: used item in a good condition. Author:Jaffrey, Madhur. Quick and Easy Indian Cookery. Book Binding:Paperback. Book Condition:GOOD. World of Books Ltd was founded in 2005, recycling books sold to us through charities either directly or indirectly. Author:Jaffrey, Madhur. My Kitchen Table: 100 Essential Curries. Book Binding:Paperback. Book Condition:VERYGOOD. Each month we recycle over 2.3 million books, saving over 12,500 tonnes of books a year from going straight into landfill sites. Madhur Jaffrey's Indian Cookery. Author:Jaffrey, Madhur. Book Binding:Hardback. Book Condition:GOOD. Each month we recycle over 2.3 million books, saving over 12,500 tonnes of books a year from going straight into landfill sites. Author:Jaffrey, Madhur. Flavours of India. Book Binding:Paperback. Book Condition:VERYGOOD. Each month we recycle over 2.3 million books, saving over 12,500 tonnes of books a year from going straight into landfill sites. Madhur Jaffrey’s Indian Cookery And A Taste Of India Paperback Bundle. Condition is Good, please see photos for condition. Indian cookery has many simple recipes covering the whole of Indian cuisine. A taste of Indian does into more depths with recipes of each region. I am selling my vintage cookbook collection so please check out my other listings for similar items I will combine postage wherever possible. Thanks so much for looking! Publisher: Jonathan Cape Ltd ISBN 13: 9780224029551. Author: Madhur Jaffrey ISBN 10: 022402955X. Title: Eastern Vegetarian Cooking Item Condition: used item in a good condition. Author:Jaffrey, Madhur. An Invitation to Indian Cooking. Book Binding:Paperback. Book Condition:GOOD. World of Books Ltd was founded in 2005, recycling books sold to us through charities either directly or indirectly. Publisher: BBC Books ISBN 13: 9780563213642. Author: Madhur Jaffrey ISBN 10: 0563213647. Title: Far Eastern Cookery Item Condition: used item in a good condition. Author:Jaffrey, Madhur. Eastern Vegetarian Cooking. Book Binding:Paperback. Each month we recycle over 2.3 million books, saving over 12,500 tonnes of books a year from going straight into landfill sites. Madhur Jaffrey's Cookbook: Food For Family And Friends. Author:Jaffrey, Madhur. Book Binding:Paperback. We appreciate the impact a good book can have. We all like the idea of saving a bit of cash, so when we found out how many good quality used books are out there - we just had to let you know! Author:Jaffrey, Madhur. A Taste of India (Great Cooks). Can't find what you're looking for?. Book Binding:Paperback. World of Books Ltd was founded in 2005, recycling books sold to us through charities either directly or indirectly. 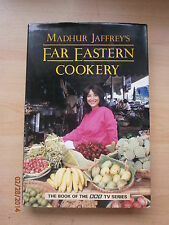 The Essential Madhur Jaffrey (Ebury Paperback Cookery). Author:Jaffrey, Madhur. Publisher:Ebury Publishing. We appreciate the impact a good book can have. We all like the idea of saving a bit of cash, so when we found out how many good quality used books are out there - we just had to let you know! Madhur Jaffrey's Indian Recipes (Pavilion Books for Real Cooks). Author:Jaffrey, Madhur. Publisher:Pavilion Books. Book Binding:Hardback. Each month we recycle over 2.3 million books, saving over 12,500 tonnes of books a year from going straight into landfill sites. Author:Jaffrey, Madhur. Curry Easy. Book Binding:Hardback. Each month we recycle over 2.3 million books, saving over 12,500 tonnes of books a year from going straight into landfill sites. All of our paper waste is recycled and turned into corrugated cardboard. Madhur Jaffrey's Foolproof Indian Cookery (Foolproof Cookery). Author:Jaffrey, Madhur. Book Binding:Hardback. Each month we recycle over 2.3 million books, saving over 12,500 tonnes of books a year from going straight into landfill sites. The Madhur Jaffrey Cookbook: Over 650 Indian, Vegetarian and Eastern Recipes. Author:Jaffrey, Madhur. Book Binding:Hardback. Each month we recycle over 2.3 million books, saving over 12,500 tonnes of books a year from going straight into landfill sites. Madhur Jaffrey's Quick and Easy Indian Cookery (Quick & Easy Cookery). Author:Jaffrey, Madhur. Book Binding:Paperback. World of Books Ltd was founded in 2005, recycling books sold to us through charities either directly or indirectly. Author:Jaffrey, Madhur. A Taste Of The Far East. Can't find what you're looking for?. Each month we recycle over 2.3 million books, saving over 12,500 tonnes of books a year from going straight into landfill sites. This new title will provide recipes for simple curries, perfect for cooking up quickly during the week. There are family-favourites, including creamy kormas, stir-fried prawns and spicy chicken recipes, as well as satisfying stews, quick kebabs and ideas for light suppers and snacks. Author: Madhur Jaffrey ISBN 10: 0563360607. Title: The Taste of the Far East Item Condition: used item in a good condition. Books will be free of page markings. Will be clean, not soiled or stained. Madhur Jaffrey's Far Eastern Cookery (BBC cookery series). Author:Jaffrey, Madhur. We appreciate the impact a good book can have. We all like the idea of saving a bit of cash, so when we found out how many good quality used books are out there - we just had to let you know! Great food: over 175 recipes from six of the world's greatest chefsTitle: Great food: over 175 recipes from six of the world's greatest chefs Edition: 1st US Edition Publisher: West 175 Pub. UK Release Date: 1998 Language: English. Author: Madhur Jaffrey ISBN 10: 0563213655. Title: Far Eastern Cookery Item Condition: used item in a good condition. Madhur Jaffrey's Indian Cookery. Author:Jaffrey, Madhur. Book Binding:Paperback. Book Condition:ACCEPTABLE. Each month we recycle over 2.3 million books, saving over 12,500 tonnes of books a year from going straight into landfill sites. 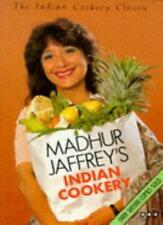 Title: Madhur Jaffrey Cooks Curries (TV Cooks) Item Condition: used item in a good condition. Author: Madhur Jaffrey,Philip Webb ISBN 10: 0563387947. Author:Jaffrey, Madhur. Flavors of India: Classics and New Discoveries. Book Binding:N/A. Book Condition:VERYGOOD. Each month we recycle over 2.3 million books, saving over 12,500 tonnes of books a year from going straight into landfill sites. Author:Jaffrey, Madhur. Flavours of India. Book Binding:Hardback. Each month we recycle over 2.3 million books, saving over 12,500 tonnes of books a year from going straight into landfill sites. All of our paper waste is recycled and turned into corrugated cardboard. Author:Jaffrey, Madhur. Foolproof Indian Cooking: Step by Step to Everyone's Favorite Indian Recipes. Each month we recycle over 2.3 million books, saving over 12,500 tonnes of books a year from going straight into landfill sites. Author:Jaffrey, Madhur. A Taste Of India. Can't find what you're looking for?. Book Binding:Paperback. Each month we recycle over 2.3 million books, saving over 12,500 tonnes of books a year from going straight into landfill sites. Title: Entertaining with Madhur Jaffrey Item Condition: used item in a good condition. 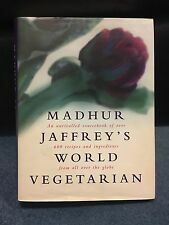 Author: Madhur Jaffrey ISBN 10: 1857933699. 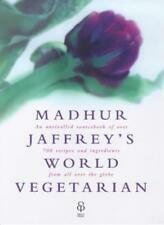 Author: Madhur Jaffrey ISBN 10: 0907516882. Title: A Taste of India Item Condition: used item in a good condition. Books will be free of page markings. Will be clean, not soiled or stained. Title: A Taste of India Item Condition: used item in a good condition. Books will be free of page markings. Will be clean, not soiled or stained. Madhur Jaffrey's cookbook: Food for family & friends. Title : Madhur Jaffrey's cookbook: Food for family & friends. Authors : Jaffrey, Madhur. Product Category : Books. Condition : Very Good. Pages : 192. Madhur Jaffrey's Far Eastern Cookery. Author:Jaffrey, Madhur. Each month we recycle over 2.3 million books, saving over 12,500 tonnes of books a year from going straight into landfill sites. All of our paper waste is recycled and turned into corrugated cardboard. Madhur Jaffrey's Indian Cookbook (Whs Exclusive). Title : Madhur Jaffrey's Indian Cookbook (Whs Exclusive). Authors : Jaffrey, Madhur. Books, Comics & Magazines Other Fiction Books Other Non-Fiction Books Childrens & Young Adult Books General Fiction Books Children's Fiction Books. Author:Jaffrey, Madhur. TASTE OF INDIA. Book Binding:Other printed item. Can't find what you're looking for?. Each month we recycle over 2.3 million books, saving over 12,500 tonnes of books a year from going straight into landfill sites. Madhur Jaffrey's Illustrated Indian Cookery. Author:Jaffrey, Madhur. Book Binding:Paperback. Book Condition:ACCEPTABLE. Each month we recycle over 2.3 million books, saving over 12,500 tonnes of books a year from going straight into landfill sites. TITLE: Madhur Jaffrey's Indian Spice Kitchen. AUTHOR: Jaffrey, Madhur. BINDING: Hardcover. Acceptable - Very well read. Reading copy only. May have significant wear and tear and contain notes & highlighting.